Sun is a conscious being, creator of our solar system, home to the Solar Council and a participant in the Earth's Experiment. 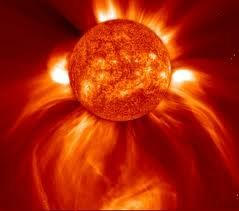 When Sun wants to influence the Experiment, it releases precise charge of the highly active Fire Element - a solar flare. Solar flares are the large explosions in the Sun's atmosphere that release solar radiation. 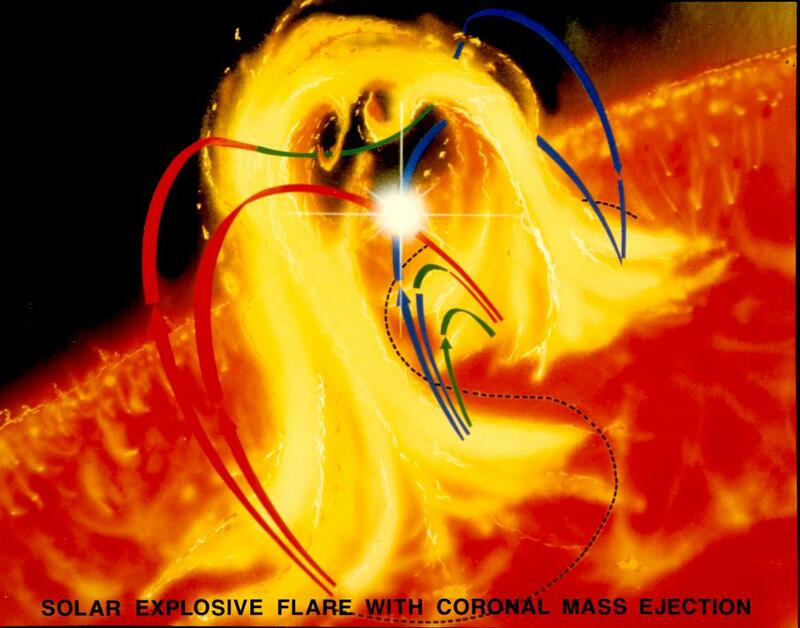 Solar flare accelerate electrons, protons and heavier ions to near the speed of light! This produces radiation (from radio waves to gamma rays). Radiation is Sun's way to excite deep feelings - in other words, a way to jump start processing of whatever new or karmic patterns we, humans, are faced with. Radiation is not bad. Right now our physical bodies are not ready to interact with this level of feeling depth, this is why high levels of radiation harm our matter-form (even though we can tolerate the lower levels). But when we become enlightened, radiation becomes one of the tools, a way of interaction with the Fire Element which does not work well for us yet. Here is NASA's picture of a Solar Flare. Most of the solar flare radiation is outside of the visible to us spectrum, so we can only see with our physical eyes less than 1/10 of the actual flare. Energetically these flares are enormous explosions. They usually originate in the areas of intense magnetic activity, called the "sunspots" (on the other stars these are called "starspots"). Sunspots that we can see on the solar surface are the exit points of the "energy tunnels" inside the sun - Sun's magnetic meridians. These meridians interpenetrate our star. Sunspots are the areas of slightly lower temperature than the rest of the Sun with very high magnetic activity because they link (like a tunnel) the solar corona (Greek word for "crown" - solar atmosphere) with the interior of the sun. 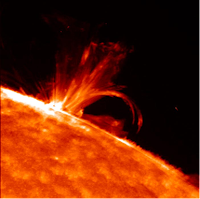 Solar flares are the release of energy stored in the corona (a directed Fire Element). The Solar Council of entities who direct and advise the Earth's Experiment, is anchored through the 4th dimension of the Sun. When there is a need to influence Earth or other part of the Solar system, the magnetic fields of the Sun are rearranged. When the two oppositely directed magnetic fields are brought together, the rearrangement of the magnetic lines of force occurs. This rearrangement is accompanied by a release of energy stored in the original oppositely directed fields. But solar flare is not just an outwardly blast of solar energy. Magnetic lines of force loop around inside a sunspot. When these loops happen very quickly one after the other, they generate lower change loops which arrange themselves into a helical spiral, unconnected to the rest of the loops. When the helical spiral "catches up"/reconnects with the other loops, the release of the pent up energy is the solar flare. When you feel sad, depressed and stuck, you need more of the active Fire Element in a form of passion - the pure charge like that is the solar flare. You can tune into the Sun and these internal loops and spirals of its magnetic field and feel the solar Fire resonating with your own. Sometimes the unconnected magnetic helical field can actually eject out of the solar corona instead of reconnecting, becoming a "coronal mass ejection" (a solar storm which is a massive burst of solar wind). Sun expresses its wisdom by distributing its informational influence throughout the solar system. When the Sun was in its active creation phase, it was spinning very fast, but with time it went into the maintenance phase of its creation, monitoring and directing Earth's Experiment now, and so it slowed down its rotation. But it still continuously extends itself into its own creation through the solar wind. Solar wind is a stream of highly charges electrons and protons, ejected from the Sun. It is responsible for slowing down Sun's rotation, the tails of comets and the radiation distribution. When a solar storm impacts Earth, it temporarily deforms planetary magnetic field, inducing large electrical ground currents in Earth's itself (which sometimes results in aurora). If you feel without support and disconnected from your own Soul, or God, or guides and the Universe (we all feel this disconnect sometimes) - tune into the Solar Wind. It constantly carries Sun's support to us. Great post Eugenia. What is the difference between solar radiation and nuclear radiation in terms of how we are effected by it? Is there a chance I can modify and use the solar wind drawing for an educational program I am compiling for the Gitche Gumee Museum, located in Michigan? Thanks for your consideration, Karen@agatelady.com.